Liverpool survived a late Reading rally to secure their place in the fourth round of the Carling Cup. A Robbie Fowler dinked finish and John Arne Riise's powerful left-foot shot put Liverpool firmly in control on the stroke of half-time. 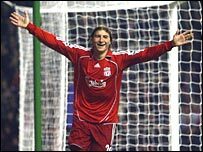 Gabriel Paletta glanced in his first goal for Liverpool just after the break before Andre Bikey headed one back. Peter Crouch appeared to seal the win at 4-1 but Leroy Lita and Shane Long made it a thrilling finish at Anfield. The late drama threatened to spoil a fine performance from Liverpool and in particular Fowler, their skipper for the evening. He scored his first goal since the first day of the season in just his third appearance of the campaign. Shortly before half-time he added to his impressive record in the League Cup, scoring his 21st goal in 23 appearances in the competition. He ran on to a pass from Jermaine Pennant and produced the sort of finish seen so often by an adoring crowd of more than 42,000. That came in the 44th minute but the Reds even had time to double their lead before the interval when Riise lashed in at the second attempt after Stack had kept out his first effort. The Reds appeared to have the tie settled five minutes into the second period when Pennant's corner from the left found Paletta, who glanced a header into the far corner. Fowler had chances to add to the scoreline before Bikey headed powerfully in from Glen Little's free-kick. But their hopes of mounting a serious threat seemed to end three minutes later when Fowler set up strike partner Crouch, who bamboozled Stack with some dazzling footwork to walk in the fourth. For the second time in four days following Sunday's defeat to Arsenal the Royals had conceded four, but to their credit they battled on and John Halls set up Lita to sidefoot home. With time running out it looked little more than a consolation until Little and Long combined to make it 4-3 in the 84th minute. Dirk Kuyt volleyed against the bar and then Fowler was twice denied by the woodwork as they searched for a fifth Liverpool goal, but their defence also survived some nervy goalmouth scrambles to go through to the next stage. "It was a very good finish. I have seen him in training every day and he is very good. Only people with his quality can do this. "It was a fantastic game for the people, it is normally not for manager but for supporters. "We need to control the game and keep the ball. At the end we could have scored and they could have scored." "We had a couple of chances to get back in it and we could have snatched a draw at the end, but I was quite pleased we didn't. "We've got a big game on Saturday and a long trip back and I'm sure Mr Benitez was thinking the same about extra-time. "So I was pleased with the performance but not with the result. "We went 3-0 down but kept playing and kept passing, Glen Little was creating problems and our set-pieces caused them problems." Liverpool: Reina, Peltier (Smith 74), Paletta, Agger, Warnock, Pennant, Sissoko (Guthrie 62), Zenden, Riise (Kuyt 79), Fowler, Crouch. Subs Not Used: Martin, Carragher. Goals: Fowler 44, Riise 45, Paletta 50, Crouch 77. Reading: Stack, De la Cruz, Bikey, Ingimarsson, Halls, Little, Gunnarsson (Sodje 83), Oster, Hunt, Lita, Long. Subs Not Used: Hahnemann, Hayes, Osano, Joseph-Dubois. Goals: Bikey 75, Lita 81, Long 85.